If your organisation uses EDM (Electronic Direct Mail – also known as email marketing), the KPI that you will most likely use to judge your campaign’s success is the “click rate” of recipients. The average email campaign will result in a click rate of between 0% – 2%. That means that out of 100 recipients, between 0-2 people will click on your email and go to your website. Sometimes “open rate” or “view rate” is the metric used to judge the success of email campaigns. If the campaign is purely to create awareness for a brand, that may be the truer metric to use. However for most campaigns the end objective is to prompt an enquiry or sale. Therefore the “click rate” is the most important metric to judge the success of the campaign. Your click rate represents your ROI for that form of marketing. Therefore increasing your click rate = increasing your marketing ROI. Design your campaign with these characteristics in mind. a discount, coupon or freebie. great advice or expert information. Tactic 3. Ensure that your email is optimised for mobile devices. 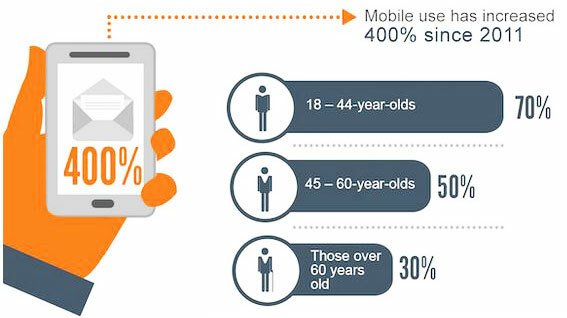 A large percentage of consumers check emails on smartphones. If your email doesn’t look good on a smart phone, you will instantly lose a large portion of recipients. Tactic 4. Personalise the campaign. Personalisation goes beyond just inserting the recipient’s name into the email. The subject line, introductory line, images, and body of the email can be personalised from one recipient to the next, based on what data you have on each recipient. If you data mined this contact’s details from a third party site, perhaps mentioning that site early on in the email will create trust with the user. This is especially true if the third party is a trusted source for the recipient. Personalisation of regions, nearby locations, towns or sites can also dramatically improve click rate, as it transforms what would have been perceived as a random outreach (that the recipient would delete) into a personalised email relevant to the recipient. Personalisation of the offer, based on previous interactions or sales history, is critical. For example, if someone purchases a lawn mower from Bunnings, the next email campaign they receive from Bunnings would be very different compared to if they had purchased a sink basin. If you don’t segment your campaigns, you will seem irrelevant to recipients and they’ll head straight for the “unsubscribe” option. Need a website designer on the Sunshine Coast? Tactic 5. Encourage social participation. For many consumers, checking online social sources, or even participating socially, may be their first step towards committing to a purchase. For example, before they purchase something they may like to get a feel for how other customers have responded to it. Are other customers angry? Or are they posting rave reviews? Perhaps post a question on a social platform about the product you’re promoting, so that previous customers can share their experience. Tactic 6. Another tactic for improving email response rates is very simple, but very powerful. It is called the “because” technique. Simply start your email using the phrase “I am emailing you because…” . An email with this as the first sentence, statistically receives a much higher response rate. By implementing the above strategies, your customers will perceive your emails to be less like random spam, and more like the building of a relationship, as they gain trust in your email communication.